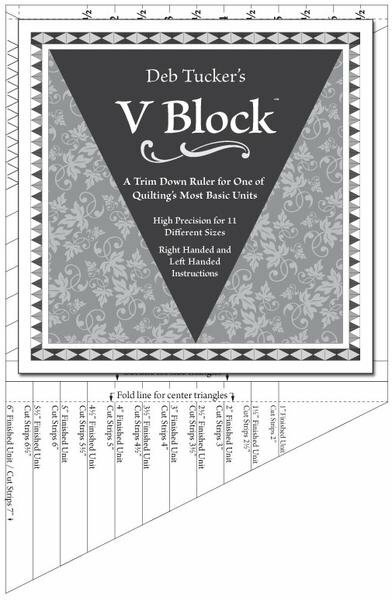 V Block from Deb Tucker's Studio 180 Design is wonderful tool for making tall star point units! Affectionately called "Peaky and Spike," a nickname attached to the unit in the 1990s, this particular shape has perplexed quilters for ages. 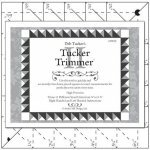 This tool, however, has quilters cutting the center and side triangles slightly over-sized and then, using the tool again, trimming the sewn piece to an extremely precise unit with perfectly aligned seams for crisp, sharp points at each intersection. 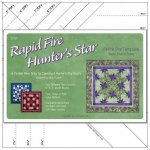 A fabulous tool for any quilter's toolbox, and a fun tool for exploring design options! Eleven unit size options from 1" (finished" to 6" (finished) in half-inch increments. This is not one of those "use it once" tools! 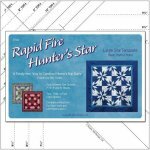 There are numerous patterns that would be so wonderful to make with this great tool!